In the Martian mining colony of ARES-6, crime pays. Three factions vie forcontrol of this corrupt new world and everything within it. You are amercenary known as a "freelancer", here to profit off the conflict, to make aname for yourself - but ambition alone isn't enough. A network of seedycontacts will assist you in undertaking the dangerous missions necessary tobolster your rep. Whether it's hiring henchmen to carry out your dirty work orplotting with secret schemes, you'll let nothing stand between you and yoursqualid goals. In Infamy, players find that nearly anything can be bought forthe right price. 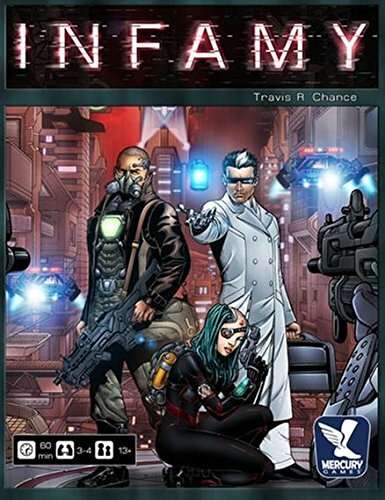 Players attempt to win the game by being the first to reach15 Infamy points or by reaching the highest reputation level in any one ofthree factions: the Harada Cartel, the Trust Megacorp, or the PKD Militia. Thecore of this auction and influence game is the "Pay to Play" mechanism inwhich players must sacrifice bidding power in order to place any bids at all.Spend too much time bidding against an opponent, and your currency willdwindle - but if you refuse to bid, you'll be forced to watch your opponentacquire all those things that only the criminal underworld can deliver. Hereat the end of the world, where everyone and everything has its price, there isbut a single ambition that endures: Infamy.